The environments are detailed and the backboards are gorgeous, but as far as mechanics and table layout, there’s a lot left to be desired. Some ramps are damn near inaccessible, and not in the challenge/reward way, more in the “I will murder someone if I lose another ball trying to hit that ramp” way. Tracks even obscure some of the letter tiles, making it difficult to judge where you should try and shoot the ball next. Virtual pinball usually lends itself to events impossible to do on physical machines, but Age of Ultron is severely lacking in this department. There are no events that open up to separate tables, so you’ll be stuck looking at the same artwork and table arrangement for your entire play session, which would be fine if the ramp layout wasn’t so frustrating to begin with. Most of the character specific mini-games amount to “Hit the ramp,” with the exception of Hawkeye’s, which has you using the flippers to fire at flying enemies, a mini-game that only seems entertaining because it’s juxtaposed with such boring ones. Age of Ultron lacks the devotion to the source material that other entries into Zen Pinball’s massive library showcases. With the exception of Tony Stark, you won’t be left with any question as to whether or not they got the voice cast from the Marvel movies. At best they sound like cheap knockoffs, and at worst it’s impossible to discern who is saying what. Thor sounds like a budget Tom Hiddleston impersonator. That’s right, Zen Pinball 2’s interpretation of Thor is, “Like Loki, but worse.” Don’t worry about confusing who it is, though, the Asgardian God constantly and bafflingly refers to himself in the third person, something none of the other characters do. The voice actors don’t offer very much, but largely the game’s script is to blame for its flatness. You’ll hear, “Thor’s might is on your side,” about 30 times each game, and there is no effort made to connect any of the in-game elements to the story of the movie. At least there’s an option to turn the voices off, but then the game feels even less like an Avenger’s game. Other than the characters standing around and occasionally moving, there isn’t much to make it feel like an Avengers table in Zen Pinball 2. The movies are characterized by massively epic fights and witty dialogue, and the feeling just doesn’t come across in the pinball iteration. 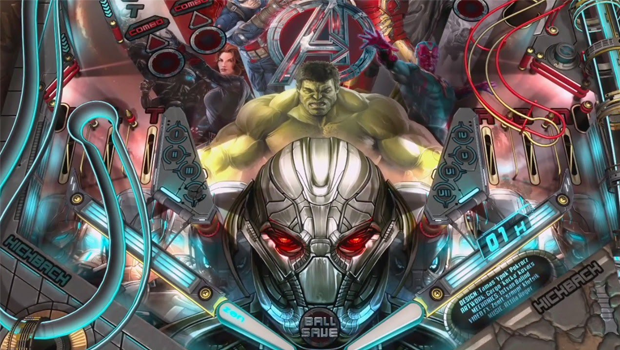 Zen Pinball 2’s Age of Ultron table doesn’t offer enough fan service to appease any level of Avengers fan, and there aren’t enough interesting mechanics to excite a virtual pinball fan. The satisfaction of knocking a ball around is present, but you can find that along with a better table elsewhere in Zen Pinball 2’s library.